"Trees" is an abstract metal art composed of two companion panels, complimenting each other Yin and Yang style. The first is a black and white/silver piece, and second a negative version of the same design. Each panel measures in at 22 inches on each side (or 44 inches overall when mounted side-by-side.) This particular design is great showpiece that combines elements of life with a sleek metal canvas. 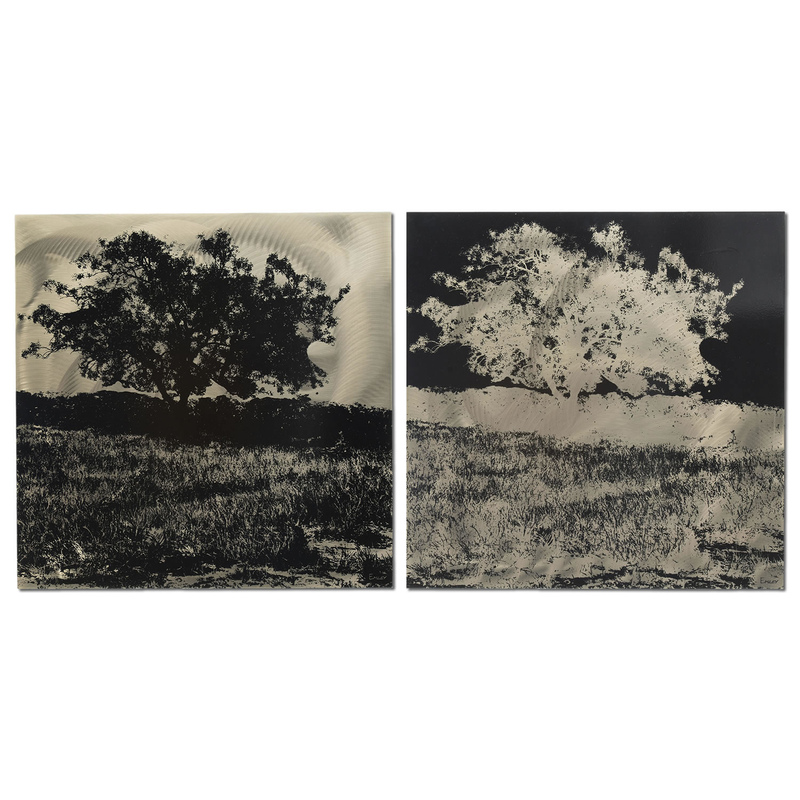 The artistic, photographic negative of a magnificent tree on a prairie with the open sky as a background gives this piece an elegant contrast between the black acrylic inks and the sheen of the steel canvas. The swirling grind pattern in the metal adds an element of depth and creates an illusion of movement and life. This contemporary wall Decor is a great piece to strike conversation and fits perfectly in any modern or contemporary space. The surface is layered with a UV-resistant clear coat to protect the image from damage or fading. You will find easy-to-use brackets on the back that will hang on nails, screws or picture hanging hooks.